This fly-on-the-monastery-wall doc about a Zen Buddhist retreat offers gentle insights and mellow vibes. If there’s something a little counterintuitive about a documentary set in the zen-like sanctum of a Buddhist retreat – achieving a state of perfect mindfulness can’t be any easier with a camera pointing at you – this slow-burn study of monastic life rewards its subjects with a warm, insightful portrayal. It may also be the most soothing 90 minutes you’ll spend in a cinema this year: the exact midway point between a documentary and meditation exercise. If it came in pill form, you could take two to recover from a Michael Bay movie. Co-directors Max Pugh and Marc J Francis’s powers of persuasion granted them three years filming at Plum Village, a remote monastery in rural France run by venerable Vietnamese émigré Thich Nhat Hanh. From the many hours of resulting footage, they’ve carefully constructed a tapestry of little moments showing its daily realities. Richly human in their detail, they act as a myth-buster to all clichés of the ascetic lifestyle. The camera lingers on a bored monk yawning his way through a meditation, we see a monastic fry-up – tofu-based, admittedly – take shape and there’s a glimpse of a family portrait on one of the resident’s shelves. A monk even affectionately compares Hanh to that other great spiritual leader, Yoda. Occasionally, Benedict Cumberbatch adds his balm-like tones, reading from the teacher's own writings (as narrators go, Doctor Strange seems a good choice for these gnomic insights). Buddhism finds life lessons in every corner of the natural world, and there are corresponding quantities of tree metaphors and Malickian cutaways of the French countryside, while long, glassy takes of monks processing through forests outstay their welcome early on. Yet like all good fly-on-the-wall documentarians, the two directors map out a compelling story from all these meditations and silent ruminations. What persuades people to leave their families and old lives to head for a forest in Bordeaux? 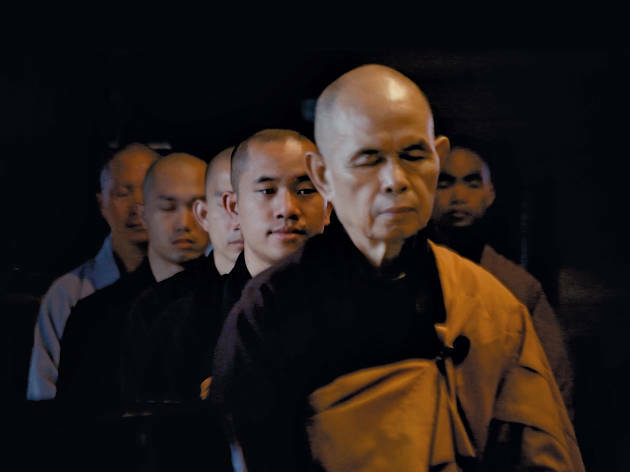 By the time Hanh and his devotees decamp to New York for a promotional tour in the second half of the film, they take us enticingly close to an answer.